All members of a red wolf pack help raise cubs. Red wolves are some of the most endangered carnivores in the world. Once widely distributed throughout the southeastern United States, these clever and highly adaptive predators suffered a similar fate to that of their gray wolf cousins. Humans relentlessly persecuted red wolves out of the fear that they might kill ranchers’ cattle and sheep — to the extent that, in 1975, 17 red wolves had to be entered into a captive-breeding program to save the species. By 1980 red wolves were declared extinct in the wild. Wolves are being persecuted and neglected by the U.S. federal government. Please act now in telling the U.S. Fish and Wildlife Service to protect these noble, iconic animals. In 1987 four pairs of red wolves were released in the Alligator River National Wildlife Refuge in Dare County, North Carolina. 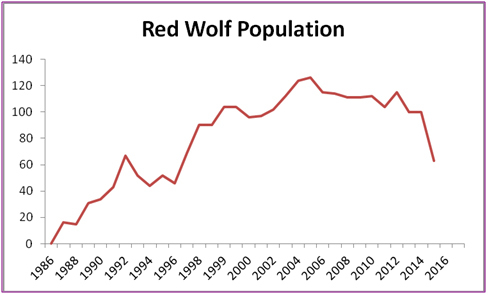 Over the following decades, this population has grown, and the red wolf recovery area has expanded to include four additional counties in North Carolina, encompassing a total of 1.7 million acres. These wolves’ reintroduction program has been considered one of the world’s most innovative and successful efforts to restore a critically endangered carnivore species. The wolves’ population peaked at 130 individuals in 2006. Unfortunately, soon after 2006, their population began to decline, and in 2014 it crashed. At the beginning of 2016, only 45 red wolves remained in the wild. Mismanagement, illegal killing and hybridization with coyotes threaten red wolves with extinction. These wolves used to outcompete coyotes, but when they were extirpated from the wild, the coyotes moved in on their former territory. Not only are red wolves now mating with coyotes, but wolves are often mistaken for coyotes and shot. It wasn’t until 2014 — after six wolves were shot in fall 2013 — that North Carolina officials made hunting coyotes illegal in the red wolf recovery area. Meanwhile the persecution of wolves by private landowners and ranchers continues. Incredibly, instead of strengthening protections for red wolves, the U.S. Fish and Wildlife Service has halted the effort to help them recover. The Service has stopped releasing red wolves from captivity into their recovery area, stopped investigating red wolf mortalities, and even ended the highly successful red wolf education program. With so few red wolves remaining, the Center is taking action to reverse this harmful trend — before it’s too late. We filed a notice of intent to sue the Fish and Wildlife Service in March 2016. U.S. Fish and Wildlife Service graph.